Note: Cloud Router Switch (CRS) series devices have highly advanced switch chips built-in, they support wide variety of features. For more details about switch chip capabilities on CRS1xx/CRS2xx series devices check the CRS1xx/CRS2xx series switches manual, for CRS3xx series devices check the CRS3xx series switches manual. Depending on switch type there might be available or not available some configuration capabilities. In order to setup port switching on non-CRS series devices, check the Bridge Hardware Offloading page. Note: Port switching in RouterOS v6.41 and newer is done using the bridge configuration. Prior to RouterOS v6.41 port switching was done using the master-port property, for more details check the Master-port page. "yes" means ether1 is part of switch and supports switch grouping, and all other advanced Atheros8316/Atheros8327 features including extended statistics (/interface ethernet print stats). 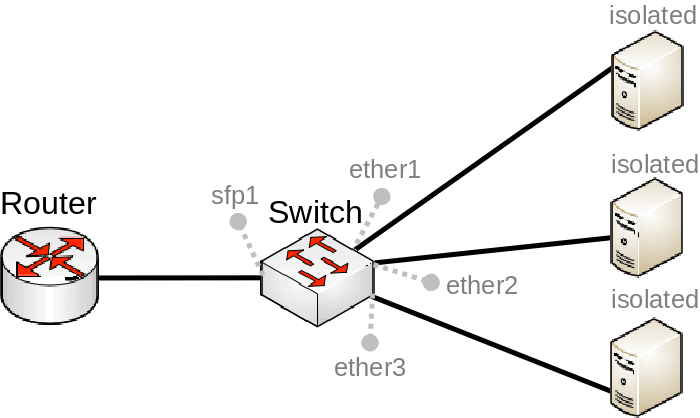 "no" means ether1 is not part of switch, effectively making it as stand alone ethernet port, this way increasing its throughput to other ports in bridged, and routed mode, but removing the switching possibility on this port. Properties under this menu are used to configure VLAN switching and filtering options for switch chips that support a VLAN Table. These properties are only available to switch chips that have VLAN Table support, check the Switch Chip Features table to make sure your device supports such a feature. Warning: Ingress traffic is considered as traffic that is being sent IN a certain port, this port is sometimes called ingress port. Egress traffic is considered as traffic that is being sent OUT of a certain port, this port is sometimes called egress port. Distinguishing them is very important in order to properly set up VLAN filtering since some properties apply only to either ingress or egress traffic. vlan-mode (check | disabled | fallback | secure; Default: disabled) Changes the VLAN lookup mechanism against the VLAN Table for ingress traffic. vlan-header (add-if-missing | always-strip | leave-as-is; Default: leave-as-is) Sets action which is performed on the port for egress traffic. add-if-missing - adds a VLAN tag on egress traffic and uses default-vlan-id from the ingress port. Should be used for trunk ports. always-strip - removes a VLAN tag on egress traffic. Should be used for access ports. leave-as-is - does not add nor removes a VLAN tag on egress traffic. Should be used for hybrid ports. default-vlan-id (auto | integer: 0..4095; Default: auto) Adds a VLAN tag with the specified VLAN ID on all untagged ingress traffic on a port, should be used with vlan-header set to always-strip on a port to configure the port to be the access port. For hybrid ports default-vlan-id is used to tag untagged traffic. If two ports have the same default-vlan-id, then VLAN tag is not added since the switch chip assumes that traffic is being forwarded between access ports. Note: Atheros8327 switch chips ignore the vlan-header property and uses the default-vlan-id property to determine which ports are access ports. For Atheros8327 switch chips the vlan-header is set to leave-as-is and cannot be changed while the default-vlan-id property should only be used on access ports to tag all ingress traffic. Both vlan-mode and vlan-header along with the VLAN Table can be used to configure VLAN tagging, untagging and filtering, there are multiple combinations that are possible, each achieving a different result. Below you can find a table of what kind of traffic is going to be sent out through an egress port when a certain traffic is received on an ingress port for each VLAN Mode. Note: The tables above are meant for more advanced configurations and to double check your own understand of how packets will be processed with each VLAN related property. Port mirroring lets switch 'sniff' all traffic that is going in and out of one port (mirror-source) and send a copy of those packets out of some other port (mirror-target). This feature can be used to easily set up a 'tap' device that receives all traffic that goes in/out of some specific port. Note that mirror-source and mirror-target ports have to belong to same switch. (See which port belong to which switch in /interface ethernet menu). Also mirror-target can have a special 'cpu' value, which means that 'sniffed' packets should be sent out of switch chips cpu port. Port mirroring happens independently of switching groups that have or have not been set up. Warning: If you set mirror-source as a Ethernet port for a device with at least two switch chips and these mirror-source ports are in a single bridge while mirror-target for both switch chips are set to send the packets to the CPU, then this will result in a loop, which can make your device inaccessible. mirror=yes/no - a packet can be cloned and sent to mirror-target port configured in "/interface ethernet switch"
Another possibility for static entries is that mac address can be mapped to more that one port, including 'cpu' port. fallback - the default mode - handle packets with VLAN tag that is not present in vlan table just like packets without VLAN tag. Packets with VLAN tags that are present in VLAN table, but incoming port does not match any port in VLAN table entry does not get dropped. check - drop packets with VLAN tag that is not present in VLAN table. Packets with VLAN tags that are present in VLAN table, but incoming port does not match any port in VLAN table entry does not get dropped. secure - drop packets with VLAN tag that is not present in VLAN table. Packets with VLAN tags that are present in VLAN table, but incoming port does not match any port in VLAN table entry get dropped. VLAN tag id based forwarding takes into account the MAC addresses dynamically learned or manually added in the host table. QCA8337 and Atheros8327 switch-chips also support Independent VLAN learning (IVL) which does the learning based on both MAC addresses and VLAN IDs thus allowing the same MAC to be used in multiple VLANs. The option "independent-learning" in VLAN table entries enables this feature. Packets without VLAN tag are treated just like if they had a VLAN tag with port default-vlan-id. This means that if "vlan-mode=check or secure" to be able to forward packets without VLAN tags you have to add a special entry to VLAN table with the same VLAN ID set according to default-vlan-id. add-if-missing - if VLAN header is not present it is added to the packet. Rule table is very powerful tool allowing wire speed packet filtering, forwarding and vlan tagging based on L2,L3,L4 protocol header field condition. rate (only applies to Atheros8327/QCA8337) - Sets limitation (bits per second) for all matched traffic. Can only be applied to first 32 rule slots. IPv4 and IPv6 specific conditions cannot be present in same rule. Menu contains ordered list of rules just like in /ip firewall filter. Due to the fact that the rule table is processed entirely in switch chips hardware there is limitation to how many rules you may have. Depending on the amount of conditions (MAC layer, IP layer, IPv6, L4 layer) you use in your rules the amount of active rules may vary from 8 to 32 for Atheros8316 switch chip and from 24 to 96 for Atheros8327/QCA8337 switch chip. You can always do /interface ethernet switch rule print after modifying your rule set to see that no rules at the end of the list are 'invalid' which means those rules did not fit into the switch chip. Port isolation provides the possibility to divide (isolate) certain parts of your network, this might be useful when need to make sure that certain devices cannot access other devices, this can be done by isolating switch ports. Switch port isolation is available on all switch chips since RouterOS v6.43. forwarding-override (interface; Default: ) Forces ingress traffic to be forwarded to a specific interface. Multiple interfaces can be specified by separating them with a comma. Note: Port isolation is not compatible with (R/M)STP, you should only use protocol-mode=none. If (R/M)STP is running on the same bridge that is using port isolation, then (R/M)STP might fail to detect a loop or not properly elect a root bridge or root ports. Warning: The forwarding-override property that has effect on ingress traffic only. Switch ports that do not have the forwarding-override specified are able to send packets through all switch ports. In some scenarios you might need to forward all traffic to a uplink port while all other ports are isolated from each other. This kind of setup is called Private VLAN configuration, the Switch will forward all Ethernet frames directly to the uplink port allowing the Router to filter unwanted packets and limit access between devices that are behind switch ports. Note: By default, the bridge interface is configured with protocol-mode set to rstp. For some devices, this can disable hardware offloading because specific switch chips do not support this feature. See the Bridge Hardware Offloading section with supported features. Note: It is possible to set multiple uplink ports for a single switch chip, this can be done by specifying multiple interfaces and separating them with a comma. All switch chips have a special port that is called switchX-cpu, this is the CPU port for a switch chip, it is meant to forward traffic from a switch chip to the CPU, such a port is required for management traffic and for routing features. By default the switch chip ensures that this special CPU port is not congested and sends out Pause Frames when link capacity is exceeded to make sure the port is not oversaturated, this feature is called CPU Flow Control. Without this feature packets that might be crucial for routing or management purposes might get dropped. Note: Make sure you have added all needed interfaces to the VLAN table when using secure vlan-mode. For routing functions to work properly on the same device through ports that use secure vlan-mode, you will need to allow access to the CPU from those ports, this can be done by adding the switchX-cpu interface itself to the VLAN table. Examples can be found at the Management port section. Warning: When allowing access to the CPU, you are allowing access from a certain port to the actual router/switch, this is not always desirable. Make sure you implement proper firewall filter rules to secure your device when access to the CPU is allowed from a certain VLAN ID and port, use firewall filter rules to allow access to only certain services. Note: It is possible to use the built-in switch chip and the CPU at the same time to create a Switch-Router setup, where a device acts as a switch and as a router at the same time. You can find a configuration example in the Switch-Router guide. RouterBOARDs with Atheros switch chips can be used for 802.1Q Trunking. This feature in RouterOS v6 is supported by QCA8337, Atheros8316, Atheros8327, Atheros8227 and Atheros7240 switch chips. 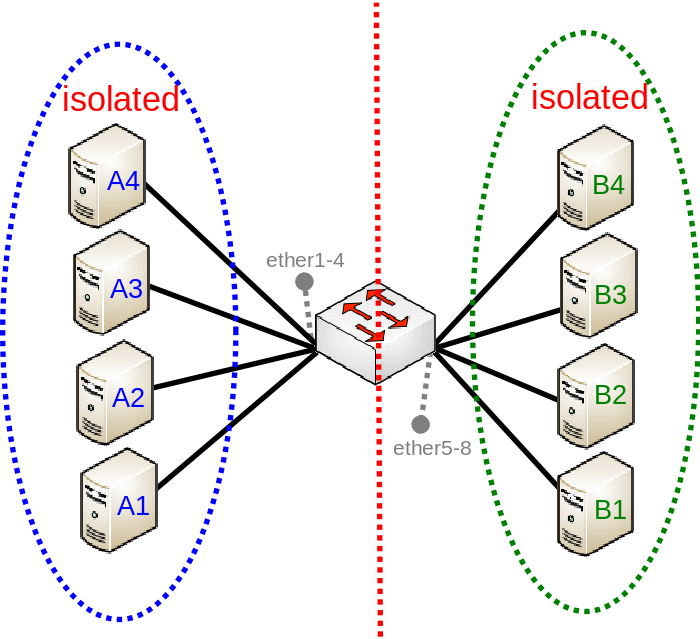 In this example ether3, 'ether4 and ether5 interfaces are access ports, while ether2 is a trunk port. VLAN IDs for each access port: ether3 - 200, ether4 - 300, ether5 - 400. Setting vlan-mode=secure ensures strict use of VLAN table. Setting vlan-header=always-strip for access ports removes VLAN header from frame when it leaves the switch chip. Setting vlan-header=add-if-missing for trunk port adds VLAN header to untagged frames. default-vlan-id specifies what VLAN ID is added for untagged ingress traffic of the access port. Add VLAN table entries to allow frames with specific VLAN IDs between ports. vlan-mode=secure will ensure strict use of VLAN table. default-vlan-id will define VLAN for untagged ingress traffic on port. In Gigabit switch chips when vlan-mode=secure, it ignores switch port vlan-header options. VLAN table entries handle all the egress tagging/untagging * and works as vlan-header=leave-as-is on all ports. It means what comes in tagged, goes out tagged as well, only default-vlan-id frames are untagged at the egress of port. Note: Only specify trunk ports in this VLAN table entry, it is not possible to allow access to the CPU with tagged traffic through an access port since the access port will tag all ingress traffic with the specified default-vlan-id value. Warning: Most commonly an access (untagged) port is accompanied with a trunk (tagged) port. In case of untagged access to the CPU, you are forced to specify both the access port and the trunk port, this gives access to the CPU from the trunk port as well. Not always this is desired and Firewall might be required on top of VLAN filtering. Note: To setup management port using untagged traffic on a device with the Atheros7240 switch chip, you will need to set vlan-header=add-if-missing for the CPU port. Note: This configuration example is not possible for devices with the Atheros7240 switch chip.